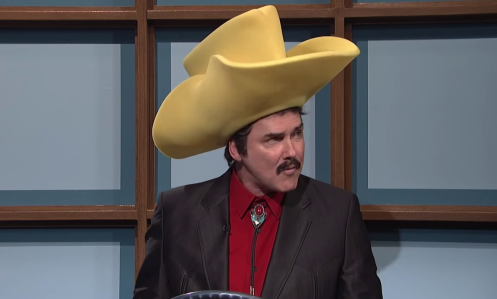 Norm Macdonald explains Celebrity Jeopardy! On Wednesday evening, Norm Macdonald sent out a long string of tweets – over 100 – giving a behind-the-scenes look at SNL’s 40th Anniversary celebration. Much of that was devoted to Celebrity Jeopardy!. Macdonald as Burt Reynolds, a.k.a. Turd Ferguson. Although the biggest news was that Eddie Murphy was asked to play Bill Cosby (ultimately, he declined), Norm gave a lot of great info on the genesis of the original skit and the philosophy behind its characters. Some outlets have put together a list of embedded tweets, but the whole thing reads much better as a long-form piece, which I’ve edited below. You can click on any line to see the original 140-character post. I got in early, Monday, so I could write. It was a massive undertaking, a 3 hour show. People were exhausted. I worked with Lori Jo Hoekstra and Steve Higgins,who was always in a suit, because he had to go be Jimmy’s sidekick, every day, round 5. I saw Lorne, thanked him, congratulated him, and shook his hand as Canadians do. He accepted. Got that out of the way early. Mood was too relaxed. I was confused as to who exactly was to be in charge of this thing. It was to be Lorne Michaels. Of course. It was to be Lorne. They wanted Celebrity Jeopardy. Higgins had two funny categories already figgered. I came up with the idea of Celebrity Jeopardy years ago by stealing it, note for note, from an SCTV classic, Half-Wits. Higgins and I co-wrote the first one years ago and I waited for Martin Short to host so I could ask permission to steal. He said that Eugene Levy had written the original. We received permission and beside Darrel and I,the talented Mr. Short played Jerry Lewis. It was always difficult to fit in that final celebrity. We never wanted a celebrity to be dumb, although many, even within the show, thought that was the idea. The idea was for Connery to be abusive and Burt to be dismissive. Sometimes people ask me who the funnier character is, Connery or Burt. The funniest character in Celebrity Jeopardy, by far, is alex Trebek as played by Will. Without Will’s perfect take on Trebek,maddened by the outright hostility of Connery, the faraway uninterest of Burt, the sketch is nothing. Nothing but Rich Little nonsense. It was always the third podium that was hard to find a man to stand behind. It would inevitably only be an impression, nothing but an empty showcase. The best to do it was Hanks, playing dumb Hanks. Hanks always got it.And Alec too. So we hunkered down to write it. 40th anniversary and all. Had to be the best one. Tough job. Very tough. Then I was told it was to have a lot of impressions, 10 or 12, so a lot of big stars could be seen impersonating other big stars. This was bad news. Celebrity Jeopardy was never about impressions. In real life, Connery is the opposite of Darryl’s take. Connery was the perfect gentleman, Burt was the funniest guy in the room. Celebrity Jeopardy was about hope. It was about the hope of one man, Alex Trebek, the hope that never died. The audacious hope that never let the facts of the past interfere. It was a rhythm piece, as each disaster was signaled by the sound of a buzzer, and each new category signified more, new, hope. And the 3rd contestant was the tough one. The third attitude always just out of reach of Higgins and me. And now we were being told we would have to do a dozen impressions. The rhythm would be gone. It was what it was, though, and what it was to be. How could it be saved from becoming an episode of copycats? And then Higgins had an idea. An idea that would blow the show wide open. Among many other things, this show was to be the return of Eddie Murphy. Eddie, the man who, in Lorne’s absence, kept the show alive. Singlehandedly. To every comedian who ever performed on SNL, what Eddie accomplished was unthinkable. Every Saturday Night at 11:30 Eddie Murphy, a kid, would fill 90 minutes with comedy. Impossible. The last anniversary was the 25th. Eddie did not attend due to a remark by David Spade. David is a very kind man, but his remark was not. So Eddie never came back. Until last week. Higgins had the idea. A video daily double. The category would be potent potables, a common one on Jeopardy, but one we somehow had never done. And the idea was that it would be a bar set. And the idea was that Cosby would be mixing a drink in a video that was taped 6 months ago. It was perfect. It was all Steve Higgins idea. At the end of the sketch, Darrel would choose potent potables. Homebase would be dressed as a bar. The iconic doors would open and on to home base would step Eddie Murphy. The audience would know what to do. Why is Eddie wearing a multi-colored sweater?He steps behind the bar, begins mixing a drink. The audience covers the fact he has not spoken. When he speaks, he is Cosby. Eddie Murphy doing a perfect Cosby impression. Here’s a relevant clip from Eddie Murphy Raw (1987). Note: contains inappropriate language. The audience does not let him finish. The sketch ends. The show, for all intents, ends. All the impressions are forgiven. The first thing to do is cut down the number of contestant/impressions and the second is to contact Eddie and to convince him to do it. The first thing to do is cut down the number of contestant/impressions and the second is to contact Eddie and to convince him to do it. The middle man to talk to Eddie was @BrettRatner, a cool guy who knows a great deal about comedy. He was with Eddie somewhere. So, the talks were underway. “Brett says Eddie doesn’t feel comfortable”, “Eddie says ‘maybe it’s ok since he’s doing pre-allegation Cosby” And on and on it went. I had not spoken to Eddie or @BrettRatner. I was dead sure Eddie would do it. Most others were not. Still, there was so much work to do. Mike and Dana showed up. They were going to do Wayne’s World. I joined the writer’s room, which Mike helmed, and tried to help. Mike Myers has an incredible work ethic and no joke is ever good enough and must be beaten, must be beaten. This is what makes him so good. This is why he has created a half-dozen perfect comedies. Work ethic, remarkable taste, and never taking no for an answer. Higgins would stick his head in the room from time to time, tell me another celeb had been cut and make me happy.I kept trying to help Mike. I didn’t get a single joke into Wayne’s World. It was a great sketch, and he did a top ten list, best things about SNL. When, on air, he announced, “number 1, the crew”, the studio audience, unprompted gave a standing ovation. I’d never seen this in 8H. [redacted: some memories unrelated to Celebrity Jeopardy!] Downey had remembered a thing Bill Murray used to do around the office, the theme from Jaws, and thought that would be perfect. But there was a problem. Bill Murray was in Carmel for the Pro-Am, which he had won a couple of years back with DA Points. With Bill Murray, golf always comes first. And so it was Saturday and Bill Murray may not make it and Eddie Murphy may not do Jeopardy and who was in charge of Update? And chaos seemed ready to sink it all. So I went to Lorne. And Lorne was in his office,which overlooks 8H,which overlooks 40 years of memories.And he was looking out the window, down on to the floor. And I was very nervous and he was perfectly calm. “Perhaps it would help if you called Eddie”, and that was that. My son got in on Saturday and wandered as the stars became bigger and bigger around him. I’m talking to Lori Jo and Higgins and Fred and my son and suddenly Paul McCartney is there. And he is in the circle of us and Lori Jo talks of being a vegan and he says his daughter works for Gucci and is a designer, but no leather. My son and I look at each other. Very cool. And the 4 of us follow McCartney in to 8H and he sits behind the piano and does 6 songs. I take a video on my phone of Fred Wolf, striking a Dylan pose, with McCartney in the background at the piano, singing. I get all filmmaker and go over Fred’s shoulder and get real close to Paul and when he finishes he is looking directly in to my camera. Then, as he finishes one and goes in to another I feel a hand on my back. The hand of security. Solid hand. There is Sarah Palin, gorgeous, and you can understand the charisma. She is irresistible. Too many superstars to take in all at one time. So happy my son could see them all. And then comes Eddie. I’m standing with my son, Lori Jo, and Chris Rock. We see Eddie from 100 yards away. Rock says, “There he is. Like Ali in Zaire.” Eddie, Bomaye. It’s my job to talk him in to doing Jeopardy. We talk in his dressing room a good hour. When it’s over, I’m convinced he’ll do it. He doesn’t. He knew the laughs would bring the house down. Eddie Murphy knows what will work on SNL better than any one. Eddie decides the laughs are not worth it. He will not kick a man when he is down. Eddie Murphy, I realize, is not like the rest of us. Eddie does not need the laughs. Eddie Murphy is the coolest, a rockstar even in a room with actual rockstars.